Our diet consists of different types of fats and oils. Many foods naturally contain fats that are essential in our diet, meaning we can only obtain them through what we eat. Our bodies cannot make them on our own. 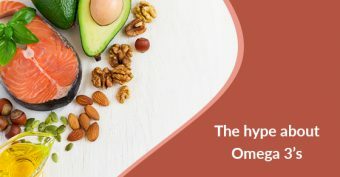 Omega 3’s are an essential fatty acid with a specific chemical structure and are important in the regulation of different processes in our body. They are the building blocks of cell wall membranes and aid in the production of hormones that regulate blood clotting and inflammation. There are 3 types of Omega 3’s: ALA (alpha linolenic acid), DHA (Eicosapentaenoic acid), and EPA (Eicosapentaenoic acid). Wow! What a mouth full! While ALA is plant –based and contained in such foods as flax seeds and chia seeds, DHA and EPA are found in animal sources, such as fish. There are a variety of benefits to our general health by taking Omega 3’s. A major one includes improving cardiac health by reducing blood pressure and preventing blood clots. They also play a role in reducing chronic inflammation in the body with conditions such as arthritis, eczema and lupus. What does it do for our eye health? Omega 3’s are instrumental in improving dry eye syndrome by increasing tear secretion. Fish oil supplements improve the function of meibomian glands lining our eyelids, which produce the oily layer to our tears. Omega 3’s have also been shown to reduce inflammation of the eyelids and surface tissues of the eyes. Are all Omega 3 supplements comparable? No! Omega 3’s in their natural form are absorbed best into the body. These natural sources of Omega 3’s are in a triglyceride form that is absorbed best into our body. Not all Omega 3 supplements are in this natural form, most are in a fatty acid form because it is cheaper to manufacture. The quality of the Omega 3 supplement as well as the quantity of specifically the DHA and EPA component are key to a high-grade supplement. Ask your eye care doctor which Omega 3 supplements are good options and the recommended daily intake based on your overall health.